Business cards are a great way to get your company name out there and promote your business. You either talk with your potential customers, get them to know who you are and what your business is about, and then you whip out your awesome business card (hopefully provided by Let It Ride) and you’ve hopefully made a lasting impression and earned some business. So how do you promote yourself/company when you’re on the go and can’t necessarily talk to every potential client walking down the street? Vehicle graphics! There are many different options when it comes to jazzin up your vehicle to promote your business. You can go the Vehicle Magnet route, if you want to use your vehicle as a Work all day, play all night, type. You can go all out and do a complete car wrap, which has been known to turn heads and really catch people’s eye. Or you can meet in the middle and get vinyls made. 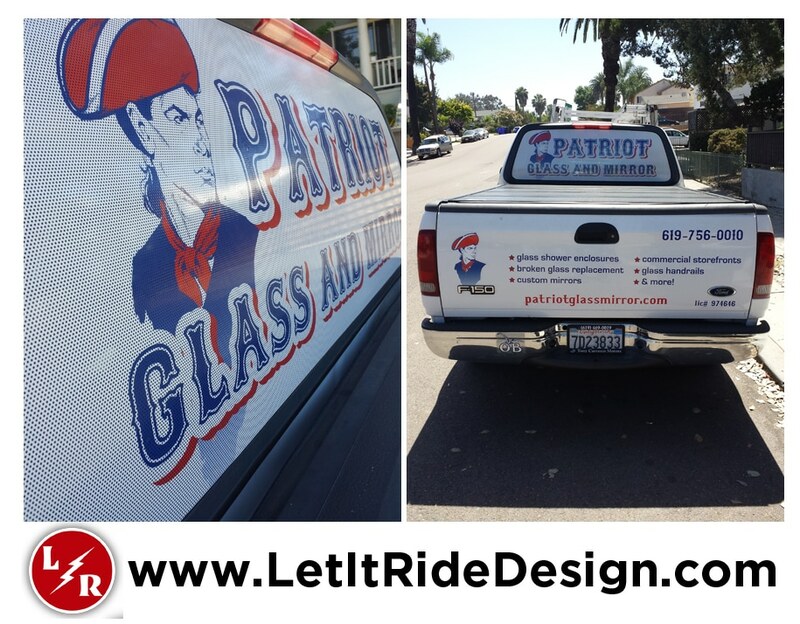 One of our clients, Patriot Glass and Mirror, did just that on his work truck. The design was custom made by Let It ride for this client. He was from Boston, and wanted to have a design that matched that vibe, hence the patriot man and the red white and blue color combo. We created vinyl for the doors of each of his work trucks to include the services he provides as well as contact information. And don’t forget about the window! The vinyl on the back window is micro perforated vinyl and is made so the driver can still see out of the window. Want to get vinyls made but don’t quite know how to apply them either straight, clean, or at all? We got your back! When receiving your quote for vinyls, ask us about our installation service. This week has been National Small Business week and we want to say a giant thank you to all of you who have participated by shopping small. We wouldn’t be here without you, so thank you!